Few days ago I noted new sites flash up on screen as a daily weather capture took place. Guernsey is the second largest of the Channel Islands, a group just off the French coast beside the Cherbourg peninsular. Met Office Datapoint have added Guernsey, Jersey is already in the data. This is surprising they are similar islands, close geographically, climatically similar. A further surprise is the 2014 Annual Weather Report (58 pages), a very good work, refreshing in this age of newspeak and excesses. The Lihou Island Automated Met Station received a major service and upgrade in the summer. The station is very important in that it measures temperatures in a completely unspoilt environment. 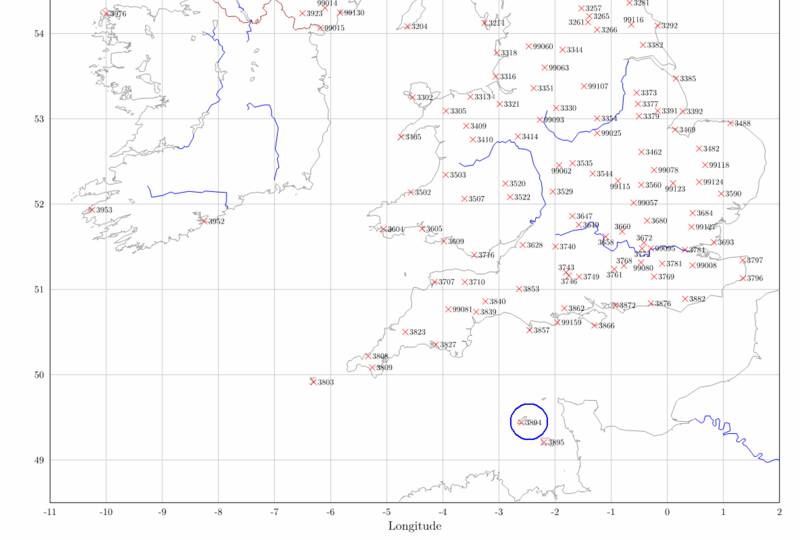 The presence of the Met Observatory at Guernsey Airport means that the airfield provides the official temperature record for the island. Since the Met Office moved there in 1947, however, the land use of the airfield and the surrounding area has changed markedly with a notable increase in the acreage of tarmac, concrete, buildings and other man made surfaces. This land use change results in the formation of an “airport heat island” a phenomenon observed around the world where areas of concrete, roads and runways heat up on days with strong sunlight and then slowly release their heat through the night. Although the Guernsey Airport heat island is small when averaged over the course of a year and only raises average temperatures by a fraction of a degree, it is an unwelcome variable that makes it harder to accurately detect temperature changes caused by genuine climate change. The Lihou record is therefore invaluable in that it measures temperature in an area where no significant development has been undertaken or will be allowed to take place. Over many years, it should therefore be possible to compare the Lihou temperature record with that of Guernsey Airport and gain an understanding of how land use changes on and around the airport are altering our temperature records. Google or Bing aerial pictures show the airport is a building site (Google Earth timeline is useful for this). A probable meteorological enclosure, near the control tower, seems to have moved quite recently, to where, no idea. Possibly the Guernsey Met Office have a separate site. In a way these are Little Englands, tax havens, more or less closed to newcomers, have local dialects, were occupied during WWII. Guernsey and Jersey are in a permanent tourist war promoting themselves as best. Whilst coastal they are a good summer holiday destination for Brits. These days most tourists fly in. In the past ferries carried rather more than today. The CI. were notable for a hydrofoil services run by Condor, rather fun. Today these have changed to catamarans. The seas can be very rough so whilst the hydrofoils could take a fair sea, many passengers wanted to be somewhere else, the cats have problems too. Ah yes, flying in during foul weather in a DC3, such as this http://www.british-caledonian.com/BCal_DC3_Part_2.html. I’ve flown into Guernsey in a Brittain Norman Islander sitting behind the pilot. The weather was 8/8 so we flew in low cloud all the way. First sight was the runway lined up on finals, full preheat on the engines. Nav, beacons. This was before jet aircraft flew into the islands, all piston engine or turboprop. Some posts on the Heathrow record will be appearing. The first is to get it out of the way before the fun starts. The BBC will not be renewing its weather forecasting contract with the Met Office.